Clam cakes. They’re just like crab cakes or fish cakes, only with clams, right? Oh no, my friend. If you think that, you would be terribly, tragically wrong. Because as much as I like crab cakes, a true Rhode Island style clam cake is so, so much more. Think clam beignet, or donut hole. Only savory. Crispy, golden brown on the outside, pillowy and light on the inside. Steam rises from the first bite. The slightest aroma of brine surrounds you. Tiny chunks of clam nestle themselves in the folds of the pillow, offering surprising bites of chewy meatiness as you down one of these little glories after another. And another. With the possible exception of the Pacific Northwest, no region can boast mastery of the humble clam like New England. And within New England, it is Rhode Island that does it best. I have never seen these clam cakes any other place. They are a masterpiece of street food. To me, they are why you arrive early at the port of Galilee to await the Block Island ferry. When I was a boy, I was partial to gigantic plates of fried clams. When I grew a little older, I discovered these clam cakes. And I’ve lusted after them ever since. They are to me the gateway food of Block Island, which is the place I learned to forage and the place whose natural beauty I still hold closest to my heart. My fondest wish is to die an old man in a little cottage on that island. But not just yet. I am 3,100 miles from Block Island right now, a long way from Galilee and Rhody clam cakes. A few days ago, as I drove home from Bodega Bay, laden with clams, I realized that this was my first real chance to make clam cakes with fresh clams I had caught since I’d moved West years ago. I looked at my bucket of horseneck clams, dug an hour before. While they are certainly not the glorious quahog of my youth, they would do just fine in a clam cake — after all, you grind the clams anyway. As it happens, these are basically clam beignets. My recipe has no corn. 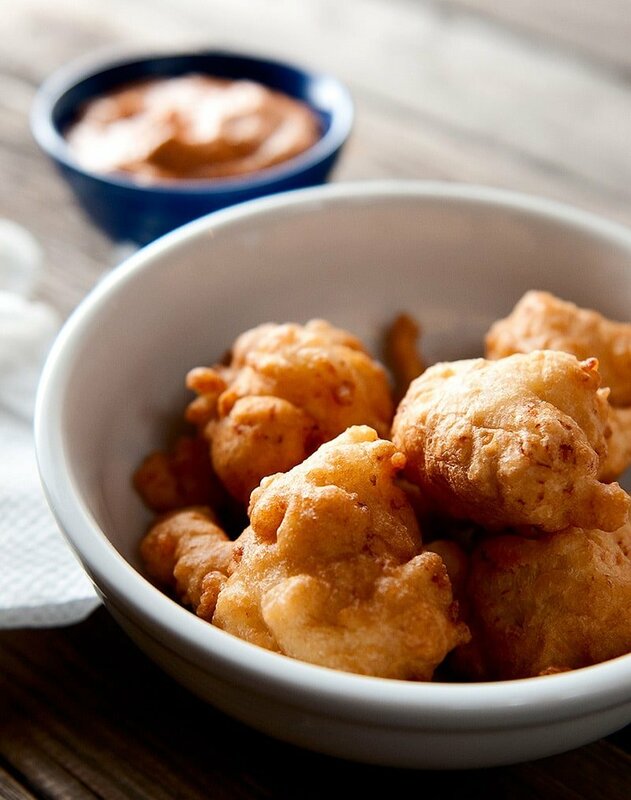 More clams than the typical fritter, cake flour instead of all-purpose, and a touch of maple syrup. Maple syrup? Trust me. You need it. Now normally Rhode Island clam cakes are served with Tabasco and tartar sauce. As you might imagine, I am more of a Tabasco man. But I could not keep thinking about how much these were like New Orleans beignets. So I decided to break from Rhode Island tradition and add a little bit of the Big Easy to this recipe: Remoulade. If I thought I loved clam cakes before this, I may now be a clam cake junkie. Holy crap but this was good! The recipe I made was way too much for Holly and I to eat at one sitting, but I decided to make them all anyway. We gorged ourselves on clam cakes until we were about to burst. I put the leftover cakes in the fridge. And you know something? They fried up almost as good the next day. Popped back in the deep fryer for 2-3 minutes, they came out fine. Premade fried food? Yes, please. This recipe is best made with freshly ground clams, although it would still be good with finely chopped clams. Canned would be OK, and better to make it with canned than not at all, but please, please, please make this at least once with fresh clams. You will not be sorry. Use cake flour if you can get it; it will make a lighter, fluffier cake. All-purpose is fine if you can't find cake flour. Use a "regular" beer, not a fancy one. Think Budweiser. For the remoulade, I used a recipe I developed with Elise from Simply Recipes. Be sure to keep your oil as close to 350°F as you can. The cakes will come out greasy if your oil gets too cool. Fry in batches to prevent this. Make the remoulade first and set aside. Heat the oil to 350°F. Mix all the liquid ingredients together except the beer. Mix all the dry ingredients together. When your oil is hot, add the beer to the liquid ingredients and mix gently. Stir in the dry ingredients just until combined. 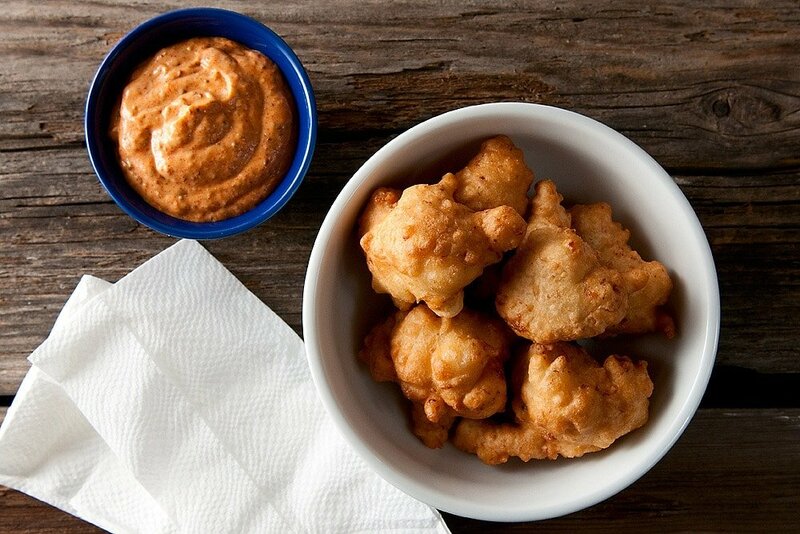 Drop a tablespoon of batter into the hot oil at a time. Do not crowd the pot. Let them sizzle for 30 seconds or so, then dislodge any that are stuck to the bottom with a chopstick or wooden skewer. Fry until golden brown on both sides, about 5 minutes. 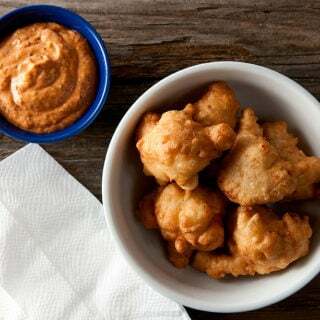 Drain on paper towels and serve while hot with the remoulade, Tabasco or tartar sauce. And beer. Lots of beer. If you can't eat all the cakes in one sitting, leave the oil in the fryer overnight; it'll be fine. Then reheat and refry the leftover cakes for 2 to 3 minutes, turning once. If you want a more traditional New England Fried Clam recipe, I got one. 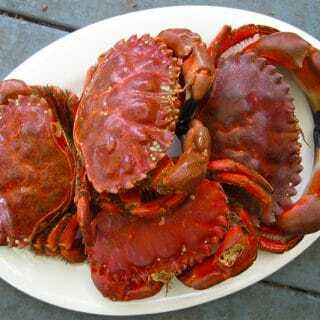 Find all sorts of recipes for clams and other shellfish right here om Hunter Angler Gardener Cook! My Grandmother made these at the family clam and lobster bake on July 4 in the 1950s. I’ve had them in Galilee, especially George’s restaurant and Rocky Point Park. Are the clams raw or cooked before chopping and adding to the batter? I grew up in RI but now live in Fl.since 1984 I miss the clam cakes from Rocky Point and there Manhattan clam chowder everyone in FL like the New England clam chowder I would Love too make both these recipes. Deniftly going to try the clam cakes thx for sharing the recipe.